Aaron Deaton from Twin Valley South throws shot put during the state finals in Columbus on Friday, June 5. His third throw landed at a distance of 56 feet, nine inches, securing the Division III state title for Deaton, who became the Panthers first state champion since 2004. COLUMBUS — Twin Valley South’s Aaron Deaton, with chalk still on his neck and in his beard, was all smiles as he received his gold medal for winning the boys’ Division III shot put during the state meet in Columbus on Friday, June 6. Deaton broke his own school record twice on the day with his first toss coming in at 55 feet, two and one-half inches before measuring his third (and winning) throw at 56 feet, nine inches. He beat his next closest opponent by seven and a half inches. 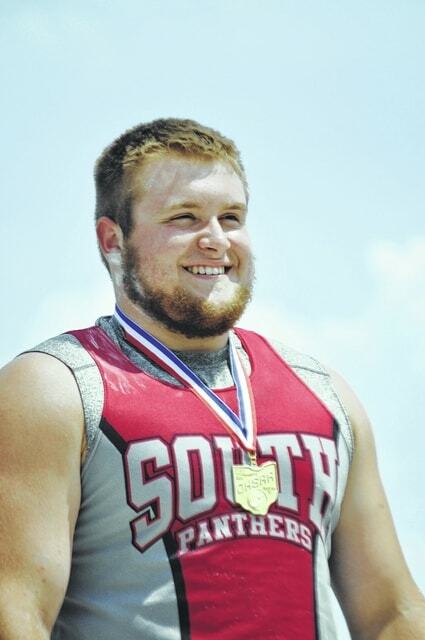 He becomes South’s first state champion since 2004 and becomes the first thrower to take gold in Panther history. Deaton is only a junior and made his second appearance at the state track meet. Last year, he was unable to reach the podium. He talked about the experience of coming to Columbus and competing against some of the best athletes that Ohio has to offer. Richie Faber, only in his second year as South’s head coach, said Deaton has been a security blanket for the team all year, guaranteeing a first, second, or third place finish out of him in the shot put and discus. But even though he had come to expect big things out of his big man, Faber was still blown away by his performance against the highest level of competition. Faber also says this raises the bar for next year’s track program. “It’s great when you see your kids get to that level of success. It’s going to raise the bar for next year, too. We’re going to have to come in do a better job to keep him on the right track and keep improving,” he said. Deaton also competed in the discus on the day, placing 11th with a throw of 146 feet, two inches. He was unable to reach the podium in that competition. “I would have liked to place but I think I’m coming off the win in shot put, it doesn’t bother me too badly to be honest. I would have loved to place but it happens,” he said.